The following is a piece that I wrote for the Columbus Dispatch, a few years back and about this time of year. The onset of spring is a favorite time of year for many, with good reason. Like a glacier of living things, spring steamrolls north at the rate of about seventeen miles a day. While the first signs of vernal life become apparent in March, the dam bursts in April and floods Ohio’s landscape with harbingers that can’t be missed. April is the month of spring, more than any other. The fore part of March is still brown and carries much of winter’s bite, and the latter part of May has greened into summer. The fourth month is nothing but an explosive burst of life on every front. On an April fool’s day trip to southern Ohio’s Shawnee State Forest, I was dazzled by the blooms of redbuds and sassafras, and a plethora of spring wildflowers brightening the forest floor. A visitor to northernmost Ohio that same weekend would have encountered a land still locked in winter’s remnants. But northerners can take hope: they’ll be treated to much the same scenery by month’s end. As the earth’s crust thaws, but before overarching trees blanket the forest in shade, a profusion of sun-loving wildflowers bursts forth. These include many of our showiest, like spring-beauty, large-flowered trillium, and bloodroot. Along with the flowers come early butterflies seeking nectar. In Shawnee, I saw ten species of butterflies, many in abundance. Among their ranks were massive tiger swallowtails, diminutive Henry’s elfins, and outrageously colored falcate orangetips. Like a glittering army, they swarmed the early blooms of spring. By month’s end, many other species will have joined their ranks, and butterflies will again grace all corners of the state. Our state tree, the Ohio buckeye, is among the first woody plants to unfurl its leaves and push forth stunning spikes of yellowish flowers. The gorgeous but deceptive flowering dogwood also hits its stride in April. It’s a trickster; those big white flowers are not flowers at all. They are modified leaves - bracts - which appear to have been dipped in white paint. The true flowers are tiny, greenish, and altogether unremarkable. Serviceberry, or shadbush, peaks this month. These small trees festoon the leafless woodlands with sprays of white flowers. The shadbush moniker stems from the blooms coinciding with the spring run of shad up creeks and rivers. To many nature enthusiasts, birds are the favorite passage of spring. The miracle of migration has evolved over eons, and Ohio plays a vital part. Of our 180 species of breeding birds, one-third winter in the tropics of Central and South America. Even more species of tropical birds pass through on their way to northerly nesting grounds, and our habitats are critical to resting and fueling them on their long journey. Brilliantly-hued orange and black Baltimore orioles that will soon announce themselves here with loud, piping whistles spent the winter in far warmer climes. Perhaps in lowland Costa Rican jungles, where they fraternized with tropical species like Montezuma’s oropendolas and bright-rumped attilas. Our tiniest avian breeder, the ruby-throated hummingbird, is now returning. These sprites, weighing the same as a penny, came all the way from southern Mexico. Jumping off from the Yucatan peninsula, hummers fly nonstop 500 miles across the Gulf of Mexico before grounding out in Texas or Louisiana. In the course of that amazing water crossing, one will beat its wings 4.5 million times. The tiny heart will pump 1.2 million times before landfall and a rest. The urge to return north and reproduce is an incredible force. Many of the plants that are conspicuous now in our neighborhoods are not native. While pretty, the Bradford pears, daffodils, and tulips don’t represent the spectacular native biodiversity of Ohio. 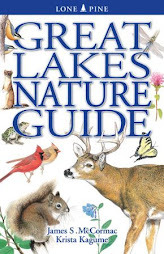 Take time to visit a place like Highbanks Metropark or Shawnee State Forest. In those places, you’ll find far more special plants doing what they’ve done every spring for eons. Along with the flora is an amazing assortment of animals that have co-evolved with them in a harmony of nature that no human hand could hope to orchestrate. Daughmer Savanna, southwest Crawford County, Ohio. This 39-acre place is one of the state's rarest treasures. I found myself flying over Daughmer this morning, en route to Lake Erie, and managed a few photos from 1,500 feet. Nearly 200,000 acres of gently undulating prairie once blanketed this region, covering parts of Crawford, Hardin, Marion, and Wyandot counties. Perhaps 0.000375% remains. That's right - an almost incalculable fraction of a percent of this former prairie remains in a state that approximates the natural conditions of the prairie. The rest has been converted to agriculture, or had buildings, roads and other development plastered over top. Slightly elevated knolls of the former prairie would have had savannas such as Daughmer; the lowest-lying areas were water-logged and possessed a completely different prairie flora. You can see bits of both in Daughmer, but it's mostly "upland" oak forest. Cast your eyes beyond the savanna and westward into the heart of the Sandusky Plains, and you can see what its fate has become. Conversion from rich prairie teeming with an almost indescribable bounty of natural riches to three primary crops: corn, soybeans, and wheat. I took this photo in November 2009 a bit further to the north. The quiltlike patterns of farm fields dominate the rich fertile prairie soils. In just this photo, there are probably thousands of miles of underground drainage pipes and tiles working to keep the ground dry enough for cultivation. Major thanks go to the Crawford County Park District for leading the charge to get Daughmer Savanna protected. It, and the surrounding land, went on the auction block last February. 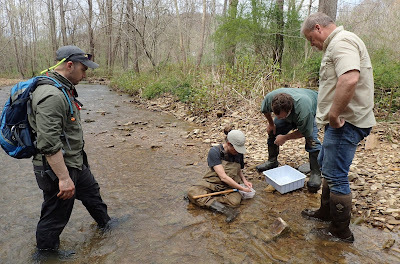 Fortunately for all of us that are keen on conservation, the Ohio Department of Natural Resources was able to broker a deal with the successful bidder, and purchase Daughmer as a state nature preserve. If you haven't had the opportunity to see Daughmer Savanna, I hope that you can make the trip this summer. I'm not sure what the access plans for the site are yet, but hopefully there will be opportunities for interested parties to visit. Your blogger (left) leans against a post in downtown Shreve. That's (from L to R) my mother, father, and brother Mike. They all made it up for the annual Shreve Migration Sensation, which dominated this small town today, and temporarily grew the local populace by 1,000 or so people. We had just stumbled from the adjacent Des Dutch Essenhaus restaurant, and my brother and I carry plunder: cookies, and some sort of insanely robust frosted rolls. Funk Bottoms Wildlife Area along State Route 95, between the burgs of Funk and Blachleyville. Lots of water, a foot or so more and we'd not be seeing pavement. There never seems to be enough time to go birding during this jam-packed event, but Peter King and I went up very early, and squeezed in a few hours of birding first thing in the morning. A ragged line of American Coots steams past. Click the pic, and look really closely, and you'll see a drake Bufflehead behind the mudhens, towards the right side. Funk Bottoms sits in a rather massive glacial outwash valley, and when it floods in the spring, it really floods. There was so much water today that the place resembled a miniature Lake Erie. Ducks abounded. Several thousand Lesser Scaup, and a great many Ring-necked Ducks, Redheads, Gadwall, Northern Pintail, and at least a smattering of nearly everything else ducky. Highlight: A ravishing adult male Black Scoter, his bulbous orange bill glistening. I like ducks of all stripes, and could watch them pretty much all day. While Route 95 to the north stayed above water, the roads to the south did not. This is Wilderness Road, and as the sign makes crystal clear, the road is CLOSED. Bright fellows that we are, Peter and I figured that out without benefit of signage. You'd have needed a boat to navigate Wilderness Road today. We noticed a bevy of Tree Swallows huddled on some wires near the Wilderness Road floodwaters, and I moved in for closer inspection. When I made these photos, the mercury indicated a brisk 22 degrees, and the overnight low had plunged into the teens. These swallows are tough customers, make no mistake. Few primary bug-eaters would venture this far north when the weather can turn on a dime from warm and sunny to frosty and freezing. The swallows were more interested in remaining fully fluffed than they were with me, and I was able to make a close approach, act the paparazzi, and leave without disturbing them. A common reaction to plumply fluffed birds such as these Tree Swallows is to ooh and aah and comment on their cuteness. This fluffiness is pure survival mode, though. By expanding their feathers, the swallows maximize heat retention by trapping and warming air near their body. Our first Tree Swallows typically return to Ohio by early March, and they are fairly plentiful by now. At least part of this intense urge to push the envelope and fly north into potentially perilous late winter weather is due to their cavity-nesting habits. Competition for cavities is fierce, and the early bird gets the worm, so to speak. The downside is the very real possibility of perishing in a brutal bout of lion-like late March Ohio weather. A fine specimen of an Eastern gartersnake, Thamnophis sirtalis, basks on a sheet of limestone along the Olentangy River in central Ohio. We ran across this serpent last Sunday; a day with warm temperatures and a sun intermittently blinking through the clouds. The snakes were out to celebrate the end of winter along with the rest of us. This gartersnake is back in hiding, I'll guarantee you that. March's notorious yo-yo weather patterns are living up to their reputation, and it's 33 degrees as I write this, with temperatures to dip to 22 tonight. With a high of 36 tomorrow, it's a safe bet this snake won't be showing his smiling face for a while. Gartersnakes are one of our more common snakes, and one of the most frequently encountered. They survive well in suburbia, and many a gardener has overturned a rock to find one. No fears - these harmless little animals don't get very big, and normally don't even attempt to bite. Even if they did, you probably wouldn't feel much, so small is their mouth, at least on a young specimen. A huge gartersnake might tape out at two feet. Not exactly the stuff of which horror movies are made. Although if you happened to be an earthworm, spider, slug or some other small critter, you wouldn't want to be confronted by this visage. Gartersnakes have especially showy tongues, and that's not a claim that everyone can make. The basal portion is a striking orange-red, and the terminal fork is glossy black. And a highly functional tongue it is; a veritable reptilian data collector. With each flick of that forked tongue, the snake captures and retrieves airborn chemicals. When it pulls the tongue back into its mouth, the tips of the fork are thrust into something known as Jacobson's Organ. This organ is the snake's data processor, and it translates those chemical cues into information that the snake can process to determine what or who is nearby. Ophidiophobia is really a tragic thing. That's the fear of snakes, and an abnormally large number of people seem to have it. Worse-case sufferers are even terrified of a charming, tiny little snake such as this one, probably to the point that they won't even look at these photos. But snakes are among our most interesting animals, and most valuable. I don't think that any of our species are getting any commoner either, at least around here. My travels this year should cross paths with some of our other snake species - at least I hope so - and I'll be sure and snap images. And you'll see them here. Humble beginnings. This is the origin of the mighty Olentangy River, a stream well known to central Ohioans. Water washing off a field in southeastern Crawford County, some 90 river miles north of its mouth, form the Olentangy. This field runoff is shunted into a culvert, and then into that ditch in the background. The Olentangy River at Highbanks Metropark, not far north of Columbus. By this point, the stream has become much larger, and far wilder. Many interesting creatures live in and along the river over its 97-mile course, and its corridors provide some of the most noteworthy scenery in central Ohio. I am giving a program on the Olentangy on Tuesday evening, March 29th at 7 pm at the Friends of the Lower Olentangy Watershed (FLOW) meeting. Location: Worthington Library, Northwest Branch, 2280 Hard Road. It's free and all are welcome. FLOW is a good group to become involved with if you are interested in the Olentangy River. Olentangy is a funny word, but Columbus residents know it well as our premier stream. It's a Delaware Indian name meaning "river of the red face paint." Good thing they changed it from the previous Delaware name: keenhongsheconsepung, which means "stone for your knife stream." I grew up near the banks of the 97-mile-long Olentangy River, in Worthington, and it had a profound effect on my life. As a lad, I frequently sneaked off to the river with my best buddy to look for turtles, fish, birds, whatever. We would grab the biggest floatable log we could move, set it adrift and hop on. Ensconced on our primitive vessel, we navigated what, to our preteen minds, was an uncharted wilderness full of exciting creatures. Jeff and I would be dumbstruck by massive great blue herons - to us, pterodactyls croaking their displeasure at our intrusion. We would marvel at the great springtime runs of redhorse suckers, with dozens of the big fish clogging the riffles. Alien-looking softshell turtles were sought, captured and imprisoned in streamside enclosures of rock. We quickly learned that softshells are expert tunnelers and could dig their way to freedom. Once, while I was wading in a clear pool, a Northern watersnake darted from a stone bridge abutment and killed a sunfish a foot from my thigh. That fired my 11-year-old imagination - as did the jumbo crayfish with the powerful pinch and the occasional mink with its silky, sinuous gait. The Olentangy River is a linear ribbon of biodiversity - and a natural treasure for Columbus. It hosts dozens of fish species, including threatened bluebreast darters. A half-dozen rare mussels burrow into its substrate, filtering food particles from the water. The white trunks of giant sycamores delineate its course, providing sanctuaries for barred owls and yellow-throated warblers. Cliff swallows build globular mud adobes under the Olentangy's bridges. This is the same swallow that made San Juan Capistrano, Calif., famous. It is but one of dozens of species of birds that breed along the Olentangy. In the early 1830s, botanist John Riddell noted a gorgeous purple-flowered aster along the river near Worthington. He gave his discovery - the sky blue aster - the fitting name of Aster oolentangiensis. The stunning plant is a fitting tribute to one of Ohio's most remarkable streams. I hope we can protect it for other kids to enjoy. Your blogger pilots a canoe down wild Little Beaver Creek in Columbiana County. I was there last Friday seeking one of Ohio's rarest breeding birds, the Common Merganser. Our party of sawbill-hunters was successful. This is Jim Dolan, an accomplished birder who lives nearby and has long surveyed the birdlife of Little Beaver Creek. Using some sort of floatable vessel, such as his kayak, is the way to go. This stream is not readily accessible any other way, and a silent canoe or kayak is without doubt the best way to find mergansers. A big thanks to Jim and Dan Justice for organizing this float, and providing the boats. We navigated about five miles of river, and it wasn't long before we happened along the first pod of mergansers. Those gleaming white submarinelike objects down there at the river's bend are the male mergansers, which were actively feeding. Four males, accompanied by three females. Mergansers are sometimes called "sawbills", as they have sharply serrated bills - a perfect adaptation for catching their dietary staple, fish. Common Mergansers are also known as "goosanders" (mainly in Europe), a nod to their massive size. A plump male can weigh four pounds or more. This pair - female on left, male on right - was paired off and quite chummy. Common Mergansers begin breeding very early, and are now forging pair bonds and selecting nest sites. Incredibly, to me at least, Common Mergansers are cavity nesters. They'll use large holes such as those made by Pileated Woodpeckers, or any available natural cavity large enough to accommodate them. Or nest boxes. Here, Jim Dolan holds a whopping big nest box that will soon be mounted to an appropriate tree along the stream. With luck, the mergansers will utilize it. Jim and Dan Justice began building and erecting nest boxes a few years back, and it appears the mergansers are taking to them. It's hard to get an exact handle on just how many breeding pairs there are, but the number seems to be rising. Nest box high on a sycamore along Little Beaver Creek. It must be pretty cool to actually see one of these jumbo ducks enter a cavity like this. Strikes me as a bit like trying to toss a sledgehammer through a donut hole, but somehow the enormous ducks readily navigate the entrance. Like Wood Ducks, the young mergansers have a bumpy introduction to life. A day after hatching, the tiny ducklings are coaxed to the box's entrance by mom, and told to jump. Soft and bouyant as they are, the ducklings bounce harmlessly off the forest floor and dash to the adjacent stream. Mrs. Merganser is a good steward, riding close herd over her flock, which might be a dozen ducklings. She'll even allow them to climb on her back and will ferry the little ones around. Common Mergansers have an extensive breeding range across northern North America, and Eurasia. Little Beaver Creek in Columbiana County is at the extreme southern limits of their distribution. I feel pretty confident that this species wasn't nesting here until fairly recently. 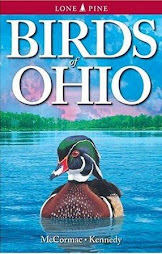 The region was covered fairly well in the first Ohio Breeding Bird Atlas, which ran from 1982-87. And there have been many sharp eyes on the creek since then, and I believe it was 2006 when the mergansers were first noted as possible nesters. Thus, it appears we have a northern species expanding its range southward, at least slightly. We're seeing the same thing with breeding Blue-headed Vireos in Ohio, and some other northerners. It may be that the mergansers are merely reclaiming former nesting grounds, following a long-term recovery of the habitat. I don't think so, though, as the valley of Little Beaver Creek has long had the extensive mature forest buffering the stream that Common Mergansers require. Also, mergansers were found in appropriate nesting habitat along Conneaut Creek in extreme northeastern Ohio this year. It'll be interesting to see if the Conneaut birds remain to nest. Little Beaver Creek is a state and national wild and scenic river; an appropriate designation. The river and its associated habitats rank high among the wildest places that one can find in Ohio, and its aquatic habitats are among our most pristine. That's why Common Mergansers nest there. I'm grateful that we still have places like this. And I'm also greatly appreciative of people like Jim Dolan and Dan Justice, and many others like them, who work to protect and enhance Little Beaver Creek. This Saturday past, I attended a wonderful workshop on vernal pools. It was held at the Stratford Ecological Center, a jewel of a place not far north of Columbus in Delaware County. The workshop was organized and sponsored by the Ohio Environmental Council, and featured a cast of fine speakers on a variety of topics. I arrived well in advance of starting time and the arrival of the other attendees. I wanted to wander in solitude through some of Stratford's 236 acres, and drink in the ambience of the large vernal pools. Just in case you're not up on wetland types, a vernal pool is a depressional wetland that floods only for a relatively brief period. Many vernal pools are small, and in this part of the world they are typically found in forested habitats. Winter snow melt and spring rains fuel them, and vernal pools are brimming with water in March. Come summer's end, they'll start to lose water as rainfall lessens and evaporation takes its toll, along with the increased thirst of surrounding plants wicking up the pool's water. By late summer, vernal pools are often bone dry. But now, at their peak, vernal pools are packed with an incredible abundance and diversity of fauna. The pool in the photo is an absolute gem of a place. It's loaded with salamanders, frogs, fairy shrimp, caddisflies, Wood Ducks, and scores of other beasts great and small. Small, mostly. After our classroom lectures had concluded, the group headed afield to learn the secrets of vernal pools up close and personal. Our outdoor lessons were LOUDLY serenaded by legions of tiny frogs; a species that is probably our most conspicuous amphibian right now. Everyone who ventures near vernal pools or other shallow, seasonally flooded wetlands and has their ears open is familiar with the abrasive rasps of Western Chorus Frogs, Pseudacris triseriata, whether they know its name or not. A little girl in our group spotted this throaty little beauty floating in the pool, and snagged it with a deft lunge. Western Chorus Frogs are only an inch and a quarter or so, but have the vocal pipes of a Pavarotti. Get a whole gang of these guys together and bent on impressing the ladies, and the collective din is nearly overwhelming. For much of the year, these frogs are quiet and retiring, and not likely to be noticed. Not now. They just can't be missed. I made this video while standing at the edge of the pool in the photo above. It was around 9 am, and the air temperature was 39 degrees. Later in the day, as things warmed, the frogs became even more intense in their singing. Western Chorus Frogs are a classic sound of spring throughout Ohio and the Midwest. In order to keep this froggy symphony playing, we have to protect the vernal pools and other ephemeral wetlands that are the frog factories that crank them out. A beautiful vernal pool on the floodplain of Little Beaver Creek in Columbiana County. I made a five mile float down the river today wth some colleagues, in search of one of Ohio's rarest breeding birds. We found the goosanders, and more on that in a later post. At one of our stops, we heard the distinctive quacking clucks of Wood Frogs, Lithobates sylvatica, and entered the forest to investigate. Two small woodland pools were filled with riotous Wood Frogs in full courtship mode. Their collective clucks, at a distance, always remind me of a far off pack of crows whooping it up. Wood Frogs may be tiny, but they're loud, and very, very tough. No frog ranges further north than does this species, and they can survive being frozen solid. For a very brief period in early spring, wood frogs enter vernal breeding pools to meet, mate, and deposit eggs. Their noisy courtship antics are about as good a harbinger of spring as anything, and we spent quite some time admiring the frogs. The females had already begun to deposit their impossibly massive egg clusters. These masses expand considerably as the eggs uptake water; it isn't as if they come right out of the female frog at this scale. Fresh Wood Frog spawn, up close. In about a month, these eggs will hatch tiny tadpoles, and another two months after that, the tadpoles will metamorphosize into little Wood Frogs and complete the cycle. Above is a brief video that I made while standing in the vernal pool, surrounded by quacking Wood Frogs. When a person nears a pool full of active frogs, they'll all suddenly clam up and drop to the bottom. The trick is to carefully wade in, and then stand motionless for five minutes or so. After a bit, the frogs bob back to the surface and begin calling, mating, and going on with their frenzied business. It's quite a spectacle. 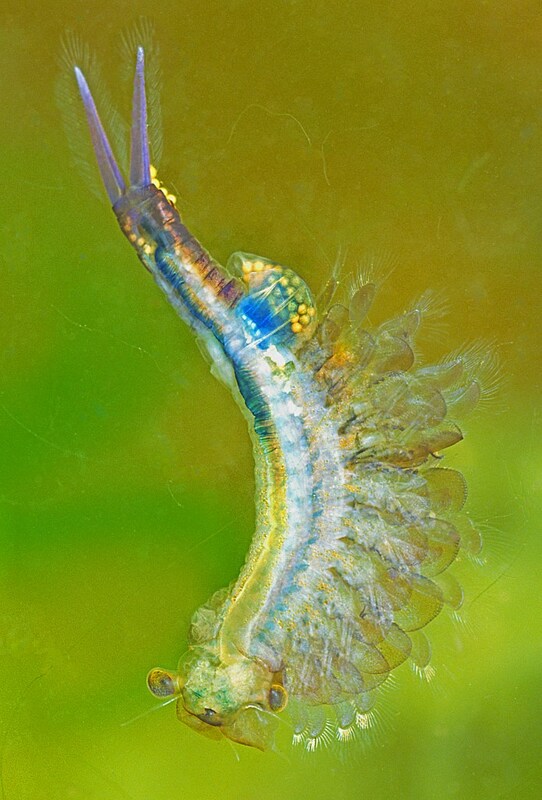 A tiny fairy shrimp, genus Eubranchipus, drifts in the water column. This is an amazing shot of one of our strangest creatures, and I thank Gary Meszaros for sending it along. It takes specials skills and equipment to make photographs such as this one. Fairy shrimp are fairly common in our vernal pools, but it's easy to miss them. An adult might tape out at one-half inch in length or so, and they're nearly translucent. They are indeed distant relatives of the shrimp that grace your dinner plate; both are in the Class Crustacea. Now is the time to look for these tiny swimmers. 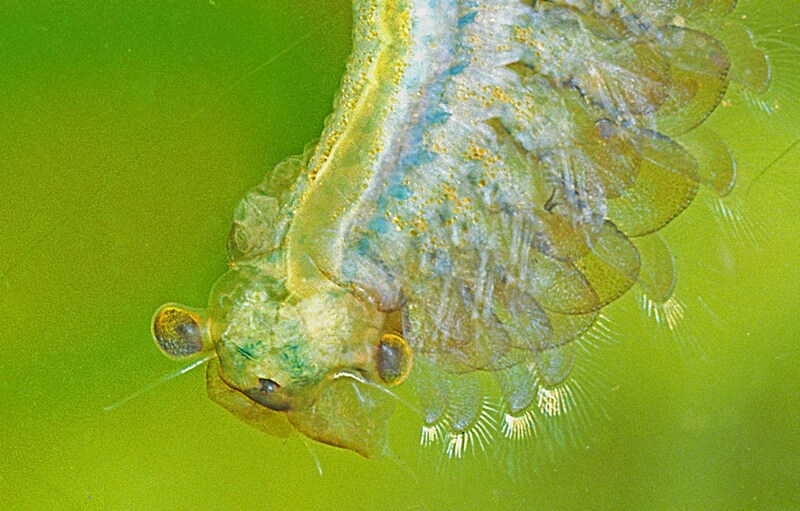 When vernal pools are in their flooded springtime glory, the fairy shrimp almost magically come to life and occasionally good numbers of them can be observed wafting through the water. They definitely prefer cool water. Once the vernal pool warms to 60 degrees or so they begin to vanish. There are apparently a few different species in Ohio; I'm not sure which one this is. Oh, what beautiful stalked eyes you have! 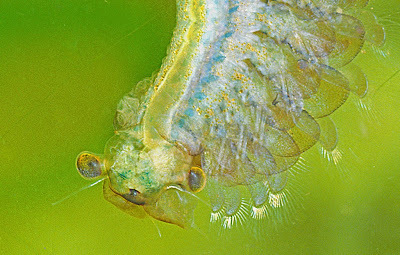 Photoreceptors in those eyes tend to draw the animal in the direction of light, so shining a flashlight into the water at night sometimes lures the shrimp. 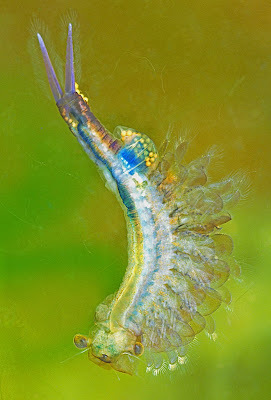 Fairy shrimp are predators, feeding upon tiny invertebrate animal life and sometimes algae and decaying plant material. In turn, the shrimp stoke the discerning palates of Wood Ducks, other birds, and larger insects such as predacious diving beetles. This shrimp is a female, as evidenced by this brood pouch filled with cysts. The cysts are embryonic shrimp that are encased in a hard shell. These tiny shrimp-to-be are rather indestructable and can survive passage through a duck's digestive system, dessication, and extremes of heat or cold. The cysts of related species have been found buried in soil, and estimated at 10,000 years of age. Some of these ancient fairy shrimp cysts have proven to be viable! Vernal pools, ephemeral as they usually are, are amazing habitats tht burst with all manner of life during their brief glory. 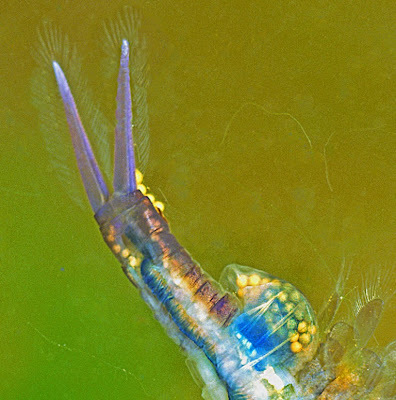 This incredible fairy shrimp photo is from the brand new book Animals of Ohio's Ponds and Vernal Pools, by David Fitzsimmons and Gary Meszaros. 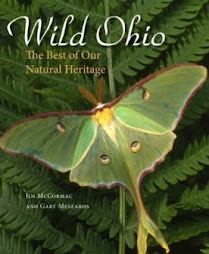 It'll soon be available, and if you have an interest in natural history, you'll do well to get a copy. Ordering information HERE. A cold American Toad creeps across the asphalt of a rural western Ohio road. Finally, last night I escaped to the great rainy outdoors to have a go at salamandering. We've already had some good nights - reasonably warm and rainy - and I'm sure that many of our amphibians have already made their way to the vernal pools to mate and release their spawn. As I'm sure most of the sophisticated readers of this blog know, come the first warm wet nights of very early spring, amphibians move en masse overland to breeding pools. To me, catching these slimy creep-crawlies in the act is a pleasurable rite of spring. And we scored last night, but not in a very major way. It was wet enough, with thoroughly saturated ground and intermittent drizzle all evening. A bit on the cool side at 45 degrees, but well within the operating conditions of our salamanders and other amphibians. Always a surefire crowd-pleaser, a Spotted Salamander, Ambystoma maculatum, hightails it across the road. This site sports wooded vernal pools on either side of the road, and fortunately for our viscous friends, vehicular traffic is light. Nonetheless, I always find plenty of roadkill on these forays, and that's sad. Bisecting high-quality salamander habitat with roads is an insidious impact that results in sometimes enormous mortality of salamanders and other amphibians. Depending on traffic volume, I suspect that over time entire salamander populations are destroyed by repeated carnage year after year. This Spotted Salamander was a big boy; about as large as they come. Spotteds are in the genus Ambystoma: the fabled mole salamanders. For most of the year, they dwell subterraneously, pushing through the damp soil and feeding on various invertebrates. When triggered by various cues in early spring, most mole salamander species burst from the soil and take up an overland march to ancestral breeding pools. Catch it just right and hit a prime spot, and you might find hundreds if you're willing to brave dark, rainy and cool conditions. An odd duck, this gal. It is a so-called "unisexual" salamander and the area where I photographed her has many. This animal and her ilk are the product of longtime hybridization between several species of mole salamanders. The parentage involves Blue-spotted Salamander, Ambystoma laterale, Smallmouth Salamander, A. texanum, Jefferson Salamander, A. jeffersonianum, and sometimes Tiger Salamander, A. tigrinum. Almost all if not all unisexuals are female, and individuals have extra sets of chromosomes. The genetic makeup of these beasts varies wildly, as does their appearance. This individual is particularly well markedwith porcelain-blue flecking on its sides, a sure sign of Blue-spotted Salamander genes. I'm guessing that Smallmouth genes are present, too, and who knows what else. How these things reproduce and carry on is not well understood. I've seen their egg masses, and nearly all of the eggs appear to be only partially developed. Apparently some of them must be fertile and hatch, though. Somehow the unisexual saamander manages to pick up the sperm of fertile "pure" males of one of the species that I mentioned above. I don't pretend to understand the unisexual salamander phenomenon; if you do, feel free to comment and enlighten. Weird stuff. Well, unisexual or not, mole salamanders are things of great beauty and interest and seeing them is always a treat. Friday night is looking like conditions could be good for another run, and if it is I'll probably be bck out and looking for the mammoth Tiger Salamanders. Today is "Buzzard Day" in Hinckley, Ohio. This now legendary rite of spring features the Turkey Vulture, and its return to northeastern Ohio. Their return is symbolic of winter's demise and warmer days to come for the snow-encrusted igloo-dwellers who live up there. Ringmaster Bob Hinkle, chief organizer of the affair, mounts his perch in the pre-dawn hours, often surrounded by dozens of buzzard enthusiasts. They eagerly await the first vulture, and its identity must be confirmed with an official confirmation from Mr. Hinkle. They never fail to spot one of these macabre masters of the air. Of course, various ignorami have the temerity to report vultures in the vicinity of Hinckley prior to March 15 and Buzzard Day. These bat-blind fools must be looking through fogged up binoculars and using hopelessly smudged and water-stained Sibleys as a reference. Bob Hinkle's research has clearly shown that pre-Buzzard Day "vultures" are Creagles - hybrids between crows and eagles. They do look a bit like buzzards from afar, to those of unsound mind and 20/400 vision. Anyway, I was at the other end of the state last Saturday, where sighting of pre Ides of March vultures can be legitimate. And I saw some. Reality Check: some could construe the following photos as somewhat gruesome. A platoon of Turkey Vultures frolicks in a Pike County field. They are making a meal of a road-killed white-tailed deer. As a young lad, I would occasionally lie on my back and watch the vultures languidly floating high on thermals. Their flight was so effortless and graceful that it made up for the birds' awkwardness when grounded. What a thing, thought I, to be able to fly like that. And so it would be - if you didn't have to partake of their dietary fare. Vultures dive into unspeakably nasty roadkill and such that could gag a normal person at 50 yards. I don't think the ability to soar like an eagle - or creagle - would be adequate compensation. A worn and tattered Mourning Cloak butterfly, Nymphalis antiopa, rests on oak leaf litter in southern Ohio. This species overwinters as an adult, riding out the winter in sheltered nooks and crannies. Come a decently warm spell, and out they come. I made a wide-ranging jaunt through southern Ohio last Saturday, when temperatures peaked in the high 60's. One noteworthy ridgetop carpeted with chestnut oak had a small flurry of Mourning Cloaks; perhaps 4 or 5 flitting about. I also saw a first-of-year Comma, another species that winters in its adult form. Interestingly, like the Mourning Cloak, these two species also range broadly across Europe and Eurasia. The appearance of butterflies is a surefire sign of spring and warmer days. A red morph Eastern Screech-owl peers from a Toledo mailbox. As noted on the box, this owl has been approved by the Postmaster General. I am beginning to wonder if these owls are traveling to and fro from Hogwarts, carrying mail for Harry Potter and crew. Since posting the last postal owl, I've heard from a few other people regarding screech-owls that have taken a shine to mailboxes. The great photo above comes courtesy of Mary Kay Solt, who snapped the little fellow in her Toledo neighborhood about a month ago. Thanks to Mary Kay for sharing her work, and to Cathy Wilson for making me aware of this mail owl. Now, if anyone finds a Snowy Owl crammed in one of these boxes, PLEASE let me know! I made a long rambling cruise through southern Ohio yesterday, ostensibly to check for waterfowl on the extensive flooded fields along the lower Scioto River. There were plenty of ducks - and lots of flooding - and I'll post something on that later. With temperatures pushing 70 degrees, it was the first truly warm and springlike day, and I knew that some of our earliest flowers would be in bloom. So, some special side trips were made to secret little Ohio River Valley hotspots. In these rocky glens, the stones and southern exposure create little pockets that heat up earlier than their surroundings and stimulate the local plants to get a jumpstart on the rest. This one wasn't hard to find in sunny sandy and gravelly spots. It's Whitlow-grass, Draba verna, a non-native member of the mustard family. A ubiquitous denizen of open waste areas, the plant is a tiny annual. This one might have towered an inch or so skyward. Small as it may be, these little mustards have a cetain charm to them. It didn't take long to stumble across lemony drifts of Coltsfoot, Tussilago farfara, festooning roadside banks. This dandelionlike member of the sunflower family is a commonly established Eurasian weed with us, and a true harbinger of spring. It pushes forth naked scapes topped by the beautiful flowers starting about now. Later, once the flowers have largely died away, the leaves will emerge. Coltsfoot flowers are quite showy upon close inspection. The myriad narrow rays encircle a little island of disk flowers. When in full fruit, the spherical plumes created by the seeds and their attendant fluff resemble dandelions on steroids. In a few sun-drenched agricultural fields, there were little mats of greenery bespeckled with dots of blue. You must look closely to notice these plants - they are quite easy to pass right by. It is yet another of the long-established Eurasian weeds: Smooth Speedwell, Veronica polita. Some tag it as "gray field speedwell". Personally, I find that cumbersome name about two yards longer than the actual plant. All speedwells, native or not, are things of great beauty when carefully inspected. This flower, photographed from the patch in the preceding photo, is so tiny that a dozen or so could be placed on a quarter. Such miniscule "weeds" are quite adept at dispersing themselves, as their seeds readily adhere to nearly anything and thus are quickly transported far and wide. It should be noted that the definition of a "weed" is in the eye of the beholder. When seen like this, it's hard to think of Smooth Speedwell as a weed. A little white ball nestled in a cup of sepals will soon spread its petals and become instantly recognizable to wildflower enthusiasts. Hepatica, Hepatica nobilis. While not yet peak, some sheltered rocky glens were sporting many flowering specimens, including these stark white ones. A member of the diverse buttercup family, Hepatica flower color can range from pinkish to porcelain blue to rich violet. Once, our Hepatica were considered to be two species: round-lobed (H. americana) and sharp-lobed (H. acutiloba). The alleged differences had to do with the leaf shape, but these characters don't hold up well and it isn't hard to find intermediate specimens. In a fit of common sense, botanists decided to lump our North American plants with their apparently essentially identical Eurasian counterparts. Bravo! Always a treat, the White Trout Lilies, Erythronium albidum, had begun to bloom. There are places where vat carpets of these small plants will carpet wooded slopes. We have another common representative of this genus in Ohio, the Yellow Trout Lily, E. americanum. It usually follows a few weeks later. Trout lilies rise from deeply buried bulbs, and are long-lived perennials. I suspect that some specimens, if they live a charmed life, can live for a very longtime. Finally, the true Harbinger-of-spring, sometimes known as Salt-and-pepper, Erigenia bulbosa. This Lilliputian (there you go Janet) member of the parsley family pushes and pries its way through the leaf litter of the March forest, often in profusion on floodplains. Most plants are so small that the casual woodland stroller is certain to miss them; they are so small that some are hard to see from an upright position. The specimen pictured above was gargantuan, perhaps two or three inches in height. The plants in this blog are the true vanguards of spring. Every week will see new members joining their ranks, and the wildflower army will reach full force in late April/early May in southern Ohio. That's why we hold Flora-Quest then, in the heart of Ohio's greatest forest, Shawnee. If you want to see scads of flowers and learn a lot more about them, join us. Details are HERE. Royal Tern - in Ohio!